Cannot insert explicit value for identity column in table 'tIdentity' when IDENTITY_INSERT is set to OFF. Cannot insert explicit value for identity column in table ‘tIdentity’ when IDENTITY_INSERT is set to OFF. Only one question is sufficient to challenge this myth – How should the system work when data is being moved from one table to another in case of replication or in case of a data migration? Please NOTE however that one needs to turn OFF IDENTIYTY_INSERT for normal operation of IDENTITY columns to be resumed. As can be seen from the script above, explicitly inserting values into an Identity column causes the system to increment the internal identity counter also. The test shown above clearly proves that it is possible to explicitly insert values into an IDENTITY column. This option (IDENTITY_INSERT) is very useful when working on data migration packages where it allows to pump data from one table to another “as-is”. 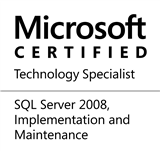 This entry was posted in #SQLServer, Blog, Imported from BeyondRelational and tagged #Identity, #SQLServer, #TSQL, DBA, Development, Myths, Series, Tips on May 30, 2013 by nakulvachhrajani.